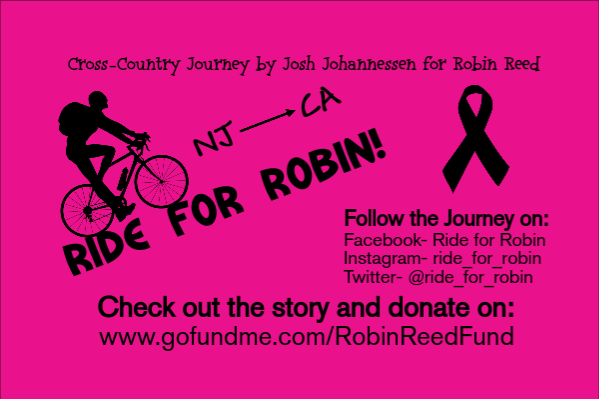 Fundraiser for Robin Reed by Joshua Kenneth : Ride for Robin! Hi my name is Josh Johannessen. I am just a 25 year old guy and I decided that I am going to ride a bicycle across the entire country. At first I thought it would just be a cool thing to do, but after I thought more into it, I came up with the idea to raise money for a certain cause. The first person I thought of was Robin Reed. She is an extremely kind-hearted person and has been a good friend of mine for over 7 years now. I used to work with her at Applebees and working with her for so many years I have become close with her and her family. Recently she has been diagonosed with breast cancer and I can only imagine how tough it will be to pay for all of the hospital bills, especially since she had to stop working at her two jobs. My goal is to raise over $25,000, but I know with the support of friends and family, much more can be raised. All proceeds from this fundraiser will go straight to Robin and her family. With your help we can give Robin and her family the support she needs and deserves throughout this difficult journey. Hello my name is Robin Reed. I am a 42 year old woman who was recently diagnosed with a metastatic ductal carcinoma, i.e. breast cancer. This was a huge surprise to me since there is no known breast cancer (or any cancer) in my family. I am married to my wonderful husband for almost 16 years and we have two girls at 13 and 8 years of age. We have lived in Sussex County, NJ for 16 years. We have chosen to live and raise our children in this area because we love the area (great things to do and you can get to a mall, a hiking trail, the shore or a city in just a short drive). We feel the schools meet and exceed the academic needs of our children. We enjoy a life with a great church, many friends and lots to do. Living in this area can be a bit costly. I recently left two jobs in order to get through chemotherapy, surgery and eventually radiation. With help from disability we will be able to keep our home, pay basic household bills and buy groceries. Our biggest concern is the hospital and doctors’ bills which have already started to come in. It costs $50.00 a visit to my oncologist office and I go three times for each chemo treatment. That averages about $300.00 a month for the next five months. As they say – “That’s just the tip of the iceberg”. Josh Johannessen and I met while working at Applebee’s together. I have many great friendships there and Josh is one of them. Josh came to me and told me of his extreme and enthusiastic idea to bike cross-country. This did not surprise me, ever since I’ve known Josh he has always liked to challenge himself. What did surprise me was when he said he was going to add my cause to his trip. He truly is an angel to me and my family and I hope he knows it. This is the map of the most accurate route I will be taking throughout this trip. The list of cities that I pass though will be mentioned below. The west coast journey up to Oakland, San Fransisco, and Seattle is still up in the air and will not be decided until I make it out to Santa Monica. I will be in Santa Monica by July 31st. Being a huge baseball fan, I plan on stopping at at least 12 different baseball stadiums along the way, which include: New York Yankees, New York Mets, Philadelphia Phillies, Baltimore Orioles, Pittsburgh Pirates, Cincinnati Reds, St. Louis Cardinals, Kansas City Royals, Colorado Rockies, Arizona Diamondbacks, Anaheim Angels, and Los Angeles Dodgers. 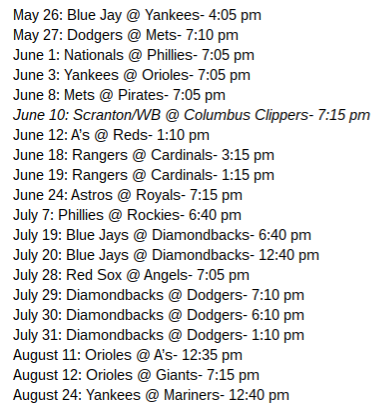 I am going to start from my house on May 26th and bike into New York City for the Yankees and Mets games on the 26th and 27th then head back home for a day. Then I'm going to make my way down to Seaside Heights, New Jersey for a big send-off from the east coast on June 1st. Next I am going to travel across the country all the way to Santa Monica, California. The journey up to this point is going to be roughly 3,500 miles. If my body allows me to do so I am then going to bike up to the Oakland and San Fransisco area, possibly going all the way up to Seattle. This would make the trip just over 5,000 miles (ending on August 24th). I would like to extend the trip as long as possible because along the way I will be selling rubber bracelets, pins, and shirts that I designed to raise additional funds for Robin. I am planning on camping along the way to save money whenever possible. This whole journey across the country is going to be both physically and mentally tough for me, especially doing it alone, but the pain I will endure doesn't even come close to the battle that Robin is currently facing as she battles breast cancer. That is going to my motivation to keep going throughout the trip. If you want to follow the journey I will be posting pictures, videos, and more on the sites listed in the picture below. Thank you for your continuous support! 5 months until the bike trip starts! If you are not able to donate, sharing the link means a lot too so more people know about it! Josh - You are amazing! I run a breast cancer foundation that provides services to women in treatment for breast cancer so we will definitely donate. But I am wondering if you would be inclined to include me as a rider, if not for all the ride at least for some? Hi Josh - I met you on the Katy Trail Ride 2016 and said I'd add a donation on Saturday after finishing my ride. I'm late on that, but am making my donation now. My sis fought cancer for 5+ yrs. I'm making this donation in her memory and hope and pray that Robin has victorious results from her battle. God bless you for doing this and Robin and her family as they meet this challenge. 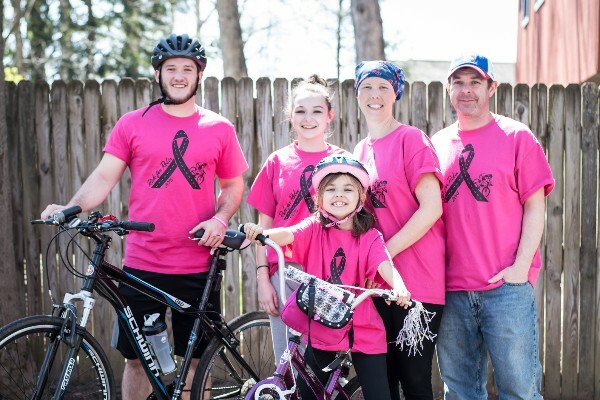 Josh, our family met you along the bike path in Cedarville Ohio. It has been exciting to watch your travels. Best of wishes to Robin! !